Drum roll please, we now have our April restaurant of the month. Big flavours, quality handcrafted pizza and great company. All new seasonal recipes and some old favourites returning, can you guess who it is? That’s right, it’s PizzaExpress. Cue the punchy combination of chargrilled aubergine, sundried tomato harissa, jalapeno & Roquito peppers topped with creamy houmous – that’s the new Vegan Mezze pizza. Barbacoa fans rejoice – pulled barbacoa beef, spicy chipotle salsa with fresh tomato, onion & coriander mix is back! To start, try the new golden crispy Devonshire Crab Arancini and to finish, Honeycomb Cream Slice – sweet honeycomb pieces on light & creamy body with a layer of salted caramel and crunchy biscuit. Invite your friends & family and enjoy the good times. Together. Our restaurant of the month is looking for a new pizza creator – & it could be one of your Piccolos! Get your kids to choose their favourite tasty toppings to create a yummy new pizza for their menu (not forgetting to give it a cool name obvs). 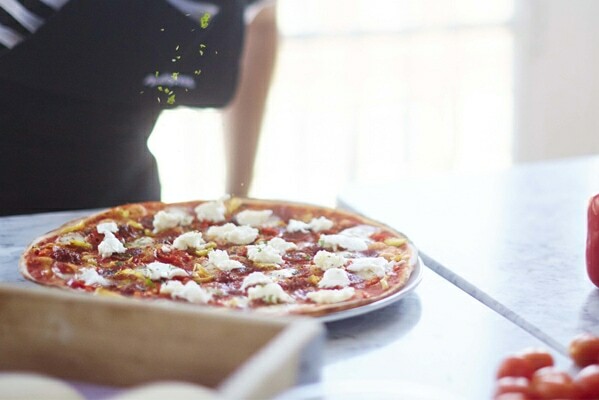 Your little one’s creation could be on their Piccolo Menu for thousands of other PizzaExpress guests to enjoy… From a veg-packed masterpiece to a meat-stacked sensation – there are loads of ingredients to choose from. Complete the form here for a chance to win.